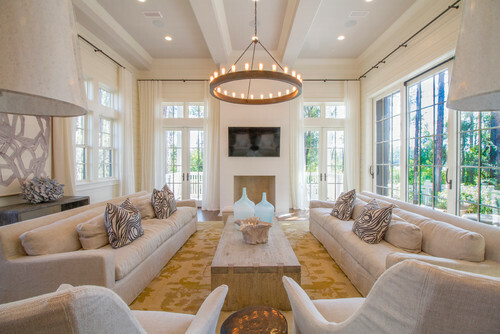 Next to the kitchen, the living room is arguably the most important room in the home. True to its name, it’s where life happens. It’s where guests gather, where you spend lazy evenings by the fire (or basking in the soft glow of Netflix—no judgment here), and, in most floor plans, one of the first spaces you see upon entering your home. Don’t you want it to look luxurious? We thought so. Fortunately, you don’t have to spend busloads of cash to make it look like you spent a lot of money. 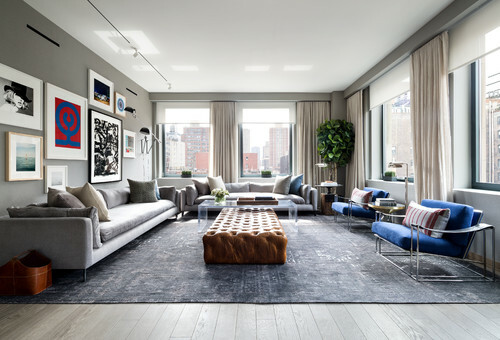 We’ve consulted with our stable of design experts to uncover the sneakiest ways to create a plush-looking living space—all without emptying out your 401(k). In some cases, you won’t need to spend a thing! You’re welcome. 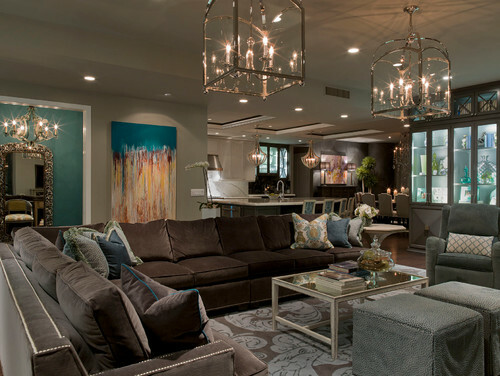 “Lighting is one of the most important concepts in a space, and one that’s often overlooked,” says Jessica Davis, owner of JL Design Nashville. You want to have a variety of light sources to add depth to the room. But you don’t have to empty your wallet to go glam on lighting. Davis loves hitting up Goodwill for lamp bases and Target for lampshades. You could also hang a great pendant light in place of a traditional table lamp, says Christina Hoffmann, owner of luxury curated goods site Epitome Home. She also loves placing candles in pretty, reflective hurricane containers. Another cheap trick that won’t require any labor: Try plug-in sconces, says Chicago-based interior designer Clare Barnes. Don’t fear—there’s a workaround: Hit up your local fabric store, where you can often find beautiful scraps for a discount—usually 60% to 90% off what it would cost if you purchased yardage off a bolt on the floor. Then find a tailor on Craigslist—Hoffmann estimates you can expect to pay $10 to $20 per pillow, depending on the size. You could also sew them yourself if you’re crafty. Pick up some feather inserts (Hoffmann loves Ikea’s) and you’re set! In the end, you can get a pillow that would easily retail for $100 or more for $30 or less. Extra credit: If you find a remnant piece of fabric that’s 2 yards or longer, get an equivalent amount of a cheap, soft backing and make a throw. “An oversized, beautiful throw casually draped in the room will make it feel more luxurious and expensive,” Hoffmann says. A good window treatment can add instant luxe factor to a room. But there’s one cardinal rule: Never, ever buy draperies that are too short. “They look so cheap and store-bought,” Hoffmann says. Make sure to measure the window before you head to the store. You could also make your own on the cheap—just pick up a sheer, lightweight cotton fabric, and take it to your tailor or dry cleaner. “You’ve got beautiful, billowy drapes for less than $35 each,” Hoffman says. 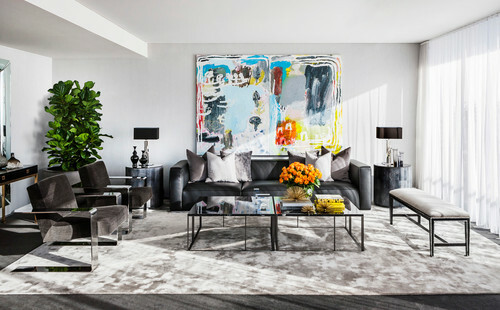 An oversize, attention-grabbing piece of art can both spark conversation and imbue your living space with an instantly cool, luxe feel. Resist the urge to hit up Bed Bath & Beyond for an anonymous beachscape, though—experts agree that the best art has personal significance. Check out secondhand shops and estate sales for pieces with a backstory. If you’re on a budget, get creative and do it yourself (all you need is a giant canvas from an art supply store and the medium of your choice). When in doubt, mix it up. Design experts recommend incorporating a variety of woods, glass, metals, and woven materials to create a look that’s collected, not matchy-matchy. 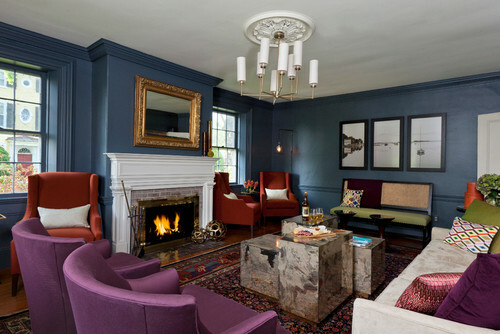 “The tactile feel of a wool sofa, the soft hand of a silk velvet pillow, or the supple texture of a quality leather are unmistakable luxury that you not only see but any guest can feel,” says Summer Thornton of Summer Thornton Design in Chicago. If you’re on a budget, toss a faux-fur blanket or sheepskin throw on your couch, jazz up leather chairs with fun pillows in chunky knit cases, or incorporate brushed brass accent pieces on a reclaimed wood coffee table. Small rugs dwarf your rooms, Hoffmann says. Opt for a larger, less expensive rug over a smaller, expensive one—especially if you have kids and pets, both of which can wreak havoc on wool rugs. “When your room feels bigger and airier due to a larger rug, it will feel more expensive automatically,” Hoffman says. And just because it looks luxe doesn’t mean it can’t be durable. Jute rugs are a great option, Hoffman says, and can often be found at discount home furnishings stores. “They offer great texture and a grounded, earthy feel,” she says. It turns out a little heavy metal never hurt anyone. “A metallic desk clock, pedestal table, or decorative accent can instantly add wattage to a room and up your fancy quotient,” Hoffmann says. 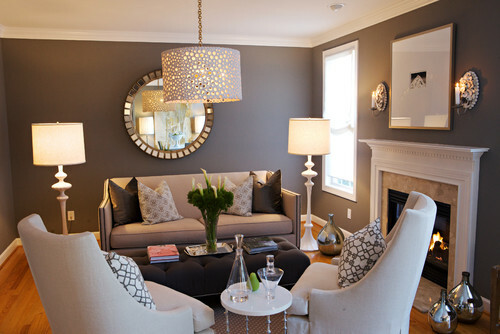 “Adding a little bit of glitz and glam can really add wow factor,” Thornton adds. In her bag of tricks: high-gloss paint, metallic wallpaper, and light fixtures with metal finishes. “One of the easiest ways to make a home feel more expensive and luxurious is to improve its interior architecture,” Thornton says. 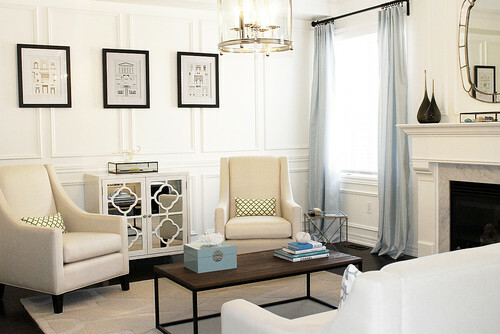 Similarly, it doesn’t cost much to add applied moldings (wainscoting, anyone?) to any wall to create more charm and character. If the idea of cutting into baseboards and walls makes you queasy, hire a pro. This one’s simple: A couple of coats of paint can dramatically change your space. And here’s a fun trick: Barnes recommends painting your walls and trim the same color. 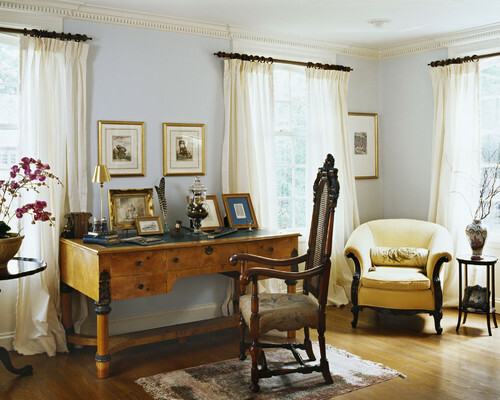 Alternatively, Barnes recommends painting doors and trim a dramatic color such as black. “This can help add interest to the space and enhance those architectural details,” she says. True life: As I struggled to decorate my new home, I found a gorgeous crystal decanter at a local thrift store for less than $10. A comparable piece sells at department stores for many times that, plus it lacks the mystique and (imagined) backstory. “The inlaid wood of an old dresser, the unique shape of a vintage chandelier, and the patina on an antique metal cabinet are unmistakably beautiful, timeless, and never confused with something new from a catalog,” Thornton says. Hoffmann likes to scour consignment and thrift stores for barware, glassware, mirrors, and art. “If you hate the art but love the frame, buy it anyway and frame an unexpected object or black and white photos you can print yourself,” she says. Don’t be afraid of mixing your antique-looking finds with your newer store-bought pieces—it’ll all come together for a collected, luxe vibe. We promise.